Call us today on 01992 636 400 or email us at info@presswarmwindows.com. At Presswarm, we believe in offering our customers the best value product offering all year but there are times when our deals get even sharper. Below is an offer to add some real value to your home in 2019! 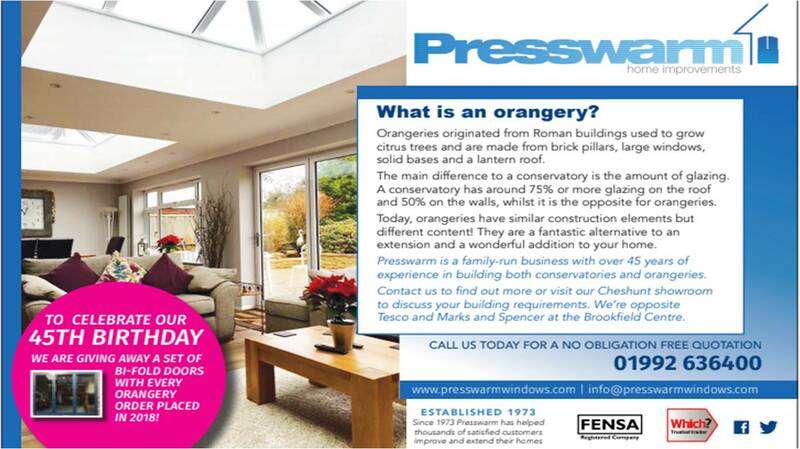 If Orange is the new black then Orangeries are the new extension! We ran an offer last year to celebrate our birthday which proved such a success we are continuing into our 46th year. With every Orangery ordered we are giving away a set of bi-fold doors, again, please ask for full details. Orangeries are becoming increasingly popular as a way to add to your living space whilst adding real value to your home. Nothing sets them off better than bi-fold doors and to celebrate 45 years of trading we are offering a FREE set of bi-folds with every orangery order taken in 2018!